A leading international wastewater instrumentation manufacturer is now incorporating Verderflex peristaltic pumps as part of its wastewater sampler systems. The pumps provide reliable and accurate performance, which helps the Hydrocell sampler systems produced by Halifax-based Smart Storm to measure the volume and toxicity of wastewater effluent. As a leading provider of water and wastewater equipment, Smart Storm needed a pumping solution which offered reliability, accuracy and the ability to lift trade effluent up to 7m, prior to it being measured and analysed, without a secondary pump being required. The company chose Verderflex R3DC OEM peristaltic pumps to fit the bill, as these compact, easy-to-maintain pumps combine the required performance with a proven track record gained in a wide variety of industrial waste applications. In 2013, Smart Storm embarked on a design exercise to replace their existing waste water sampler with a new state-of-the-art product that would meet the harsh demands of industrial wastewater sampling. The new product, known as the Hydrocell sampler, included the Universal Smart Instrument (USI) as its instrument controller, which offers the only wastewater sampler on the market with a graphical user-friendly interface and Windows CE programming. "To ensure that the new product exceeded the specification of the existing product and that of our competitors we also required the pump to perform to a higher standard than that of the old sampler pump," said Smart Storms managing director, Dr John Duffy. After exhaustive tests on numerous pumps, the Verderflex R3DC OEM pump was chosen. We choose the Verderflex pump because its vertical lift capacity of 9m far exceeded that of other manufacturers pumps, its reliability was very impressive and it was extremely robust everything we required," added Dr Duffy. Often the pump is the weakest part of a wastewater sampler so reliability is paramount. Sending engineers to site to repair pumps is extremely costly and time consuming. We have now been using Verderflex pumps on our samplers for two years and we have not had a single failure. We use the pump across our complete sampler range from single bottle samplers to multibottle refrigerated samplers. The Verderflex pump, along with the advanced USI controller, made this Hydrocell range of waste water samplers the most advanced on the market. 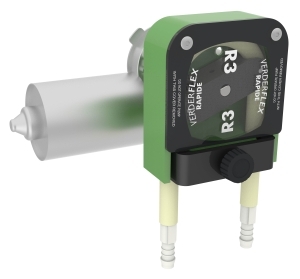 "Our R3DC pump is ideal for this type of demanding application," adds Neil Thomas of Verderflex. "It features a robust design with thick-wall tubing, and in addition to its high lift capability and a DC motor, which can accommodate speed and flow-rate variations, it can handle flow rates up to 3.4 l/min."